The Manti High School boys basketball team gathers at midcourt to celebrate their 3A State championship after their 63-50 victory over South Sevier on Saturday, Feb. 24, at Dixie State College in St. George. The saying is true in this case because Manti High School’s defense propelled them to the 3A State boys’ basketball championship. Although the Templars came as the No. 3-seed from Region 15, Manti quickly established itself as the hottest team in the tournament. Manti defeated the No. 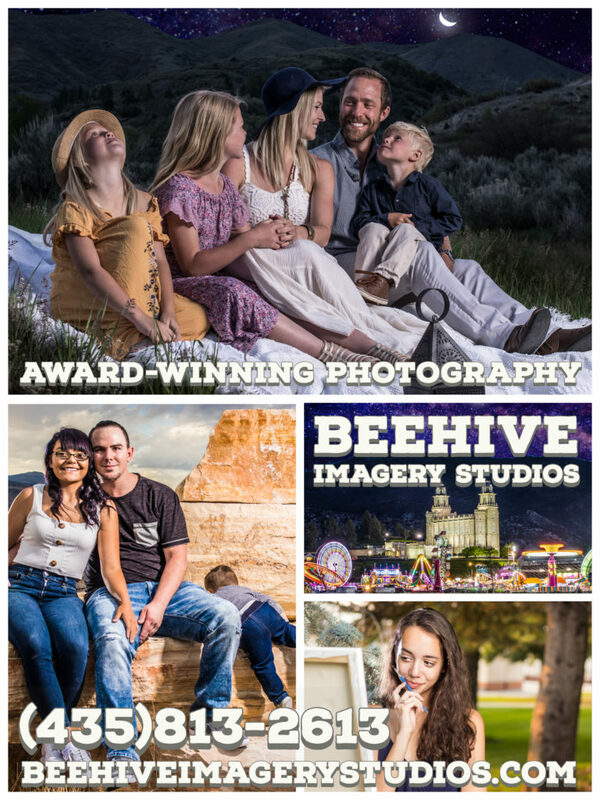 1 team in 3A, Morgan High, in the quarterfinals by seven points, beat Grantsville by 19 points in the semifinals and then took down Region 15-rival South Sevier by 13 points in the finals. In all three games, Manti rode big runs in the second half to build their leads. 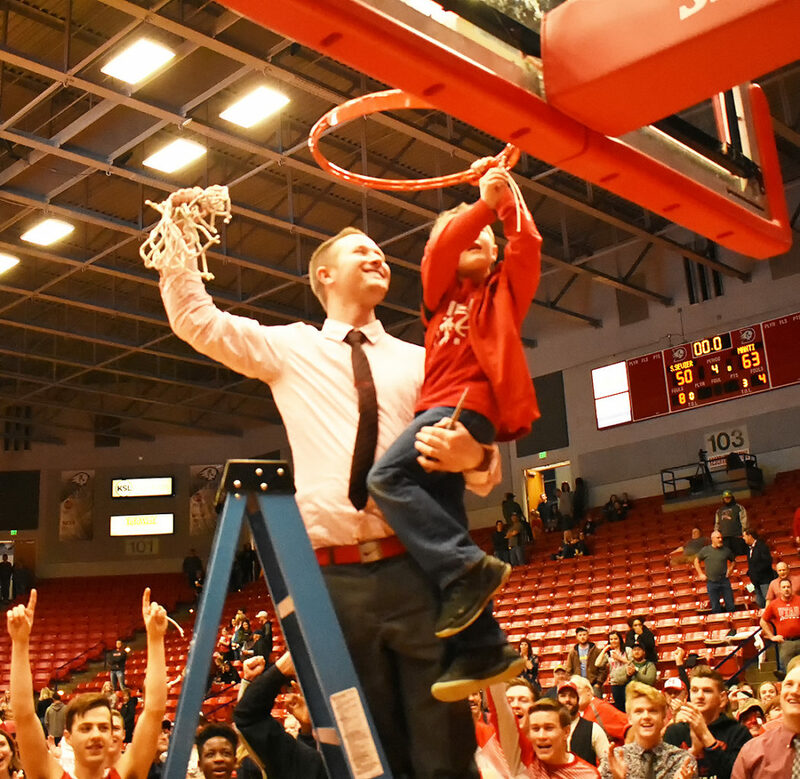 Devin Shakespear, coach of Manti High School’s boys basketball team, holds the victory net as his son pulls down the last thread. 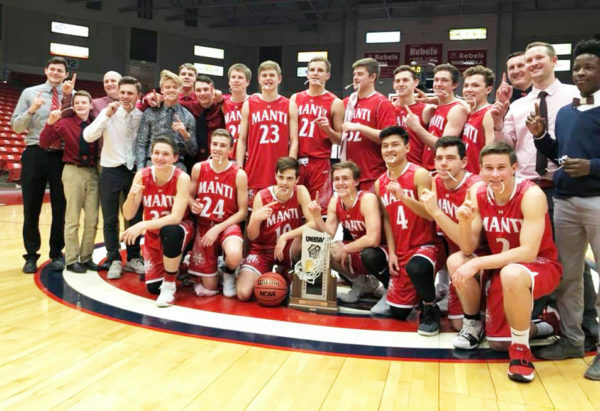 Manti won the 3A State basketball championship held at Dixie State College in St. George on Saturday, Feb. 24.
sure defense that turned into turnovers and transition buckets. 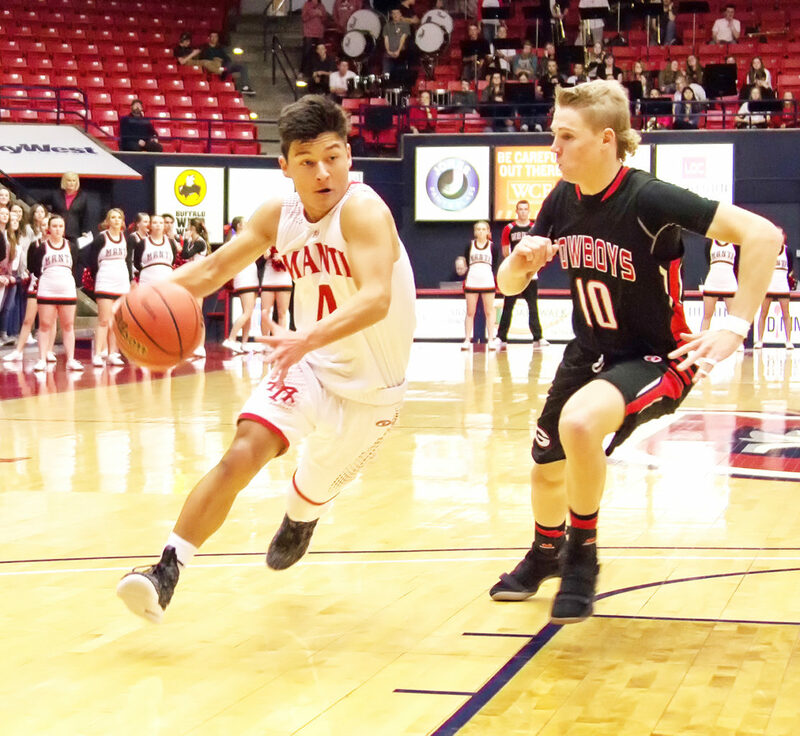 In the final on Saturday, Feb. 24, against South Sevier, a team Manti had lost to twice during the regular season, the challenge was to somehow contain the Rams’ three-point attack. In the first half, Manti’s defenders challenged the Rams’ long-range shooters but were not able to establish an advantage. However, with the Templars leading 26-22 at the half, Manti had begun to get into the Rams’ heads. South Sevier appeared to come out of halftime energized and hit a couple of three-pointers to take the lead. But Manti’s Matt Nelson answered with a three of his own, and Manti was able to push the lead back out to three. The Templars’ pressure started resulting in turnovers and easy lay-ups. And the Manti kept building, eventually getting as big as 48-31 in the third quarter. In the fourth quarter, the Templars slowed their game down to kill off the clock. With half of the quarter over, Manti started giving up points to South Sevier again. With 2:22 left in the game, the Rams had climbed back into the game, only down seven points, 54-47. From then on, the Templars turned up their defensive intensity and scrambled for turnovers. When the clock stopped again with 48 seconds to play, the Templars had built their lead back to 12 points, 59-47. When the final horn sounded, Manti had won 63-50 and held South Sevier under its season average by more than 20 points by denying the three-point shots and inviting the Rams to drive into the lane. Meanwhile, the Templars looked for cutters going under the basket and opportunistic three-point shots. The Templars were led, as they have been all season, by Nelson who drove to the basket and hit key free throws down the stretch. Nelson put in 20 points in the game, had seven rebounds and three steals. Manti’s Travis Thomson also scored in double figures with 10 points. Thomson and Nelson were named to the Deseret News All-Tournament Team. Manti’s Kade Nichols, No. 4, drives against Coy Johnson of Grantsville during the state championship semi-finals on Friday. Manti’s win that night locked them into their championship battle with So. 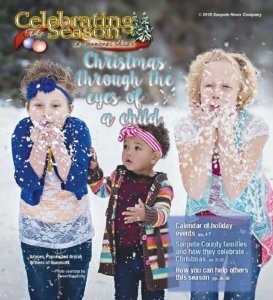 Sevier the following day, from which they emerged victorious. As impressive as the finals victory was, just getting to the finals might have been even more impressive. After needing an overtime to defeat Providence Hall in the first round, Manti faced 3A No. 1-seed Morgan in the quarterfinals on Thursday, Feb. 22. Morgan had what many considered the best player in 3A, Cade Russell. The Templars figured they would make him earn every point he got and limit the other players from getting very much also. Russell had 23, and Laine Carter had 19, yet no one else on the Morgan squad had double figures. The Templars trailed at the end of the third quarter by one point, 36-35, but then held Morgan to only three points over the first six minutes of the fourth quarter while they went on a 14-3 run. Over the last two minutes of the game, Manti made 12 of 14 free throws, including Nelson hitting 10 of 11, to fend off the comeback attempt by Morgan and win 63-56. In the semifinals, Manti faced Grantsville on Friday, Feb. 23. The game was a very tight defensive affair in the first half, with the score 9-6 after one quarter and Manti leading 21-19 at half. But Manti turned in one of its defensive shutdowns in the second half and went on an 18-0 run in the third and fourth quarters. The final score was 56-37. While holding the Cowboys to only 17-percent shooting in the second half, the Templars were able to convert easy baskets at a 62-percent rate during their run and an extremely efficient 52 percent for the entire game. Three Templars scored in double figures, with Nelson leading with 16, Dylan Wathen with 13 and Thomson with 10. Nelson also had eight rebounds and four assists.